The night of 7th-8th April 1941 went down in history as The Docks Raid of the Belfast Blitz but also saw a Heinkel shot down over Downpatrick, Co. Down. On the night of 7th-8th April 1941, the Luftwaffe made their first raid on Belfast, Co. Antrim. The Docks Raid focussed the Axis bombing on the shipyards and the heart of Belfast's industry, crucial for the war effort. The night would also see an enemy Heinkel shot down over Downpatrick. At RAF Aldergrove, Co. Antrim, Hawker Hurricanes from RAF 245 Squadron scrambled. Among those in the air was Commanding Officer Squadron leader John William Charles Simpson. With 10 previous victories over Nazi planes, he was an experienced fighter. While those prior planes fell victim to Simpson’s guns in daylight, this defence during the Belfast Blitz would be his first night-fighter victory. 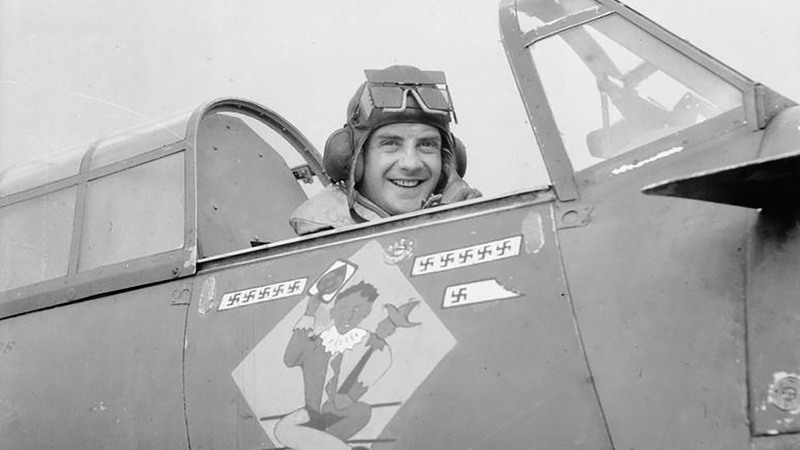 Before taking command of RAF 245 Squadron between 16th December 1940 and June 1941, Simpson flew with RAF 43 Squadron. Imperial War Museum Photo: CH 2686 (Part of the Air Ministry Second World War Official Collection). Squadron Leader John William Charles Simpson DFC, Commanding Officer of RAF 245 Squadron in Hawker Hurricane Mark I, W9145 DX-L at RAF Aldergrove, Co. Antrim on 4th May 1941. His plane shows a jester painting and the mark of his 11th victory which came in Northern Ireland on 8th April 1941. Photo taken by Flight Lieutenant Bertrand John Henry Daventry - Royal Air Force Photographer. The RAF pilot engaged with the Heinkel HE-111 at 0139hrs on 8th April 1941 at a height of 7,000 feet. The destroyed Luftwaffe plane came down around 10 miles east of Downpatrick, Co. Down in the Irish Sea. The Heinkel HE-111 came down in the sea off the coast near Downpatrick, Co. Down before reaching the target area over Belfast, Co. Antrim. The full bomb bay exploded as the plane descended. Imperial War Museum Photo: MH 6547 (Part of Term 318955 Collection). 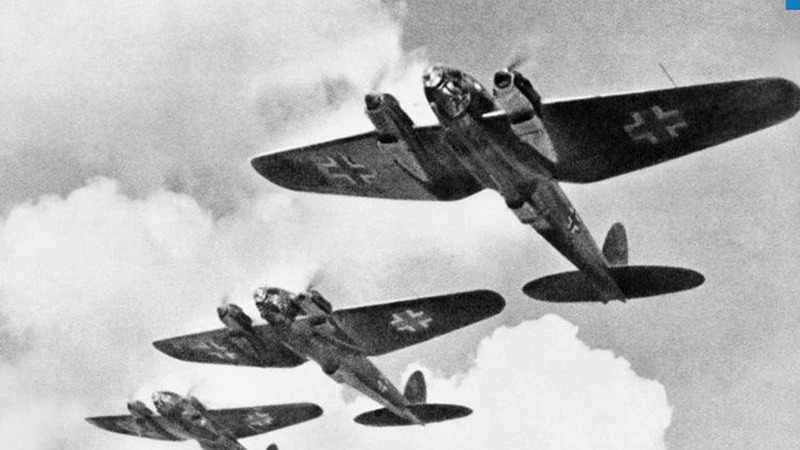 Heinkel HE111 bombers in formation. The HE111 was the mainstay of the German Luftwaffe bomber force in 1940. Approximately 500 aircraft served in 17 'Kampfgruppen' during the Battle of Britain. Photo used under Fair Dealing. On 9th April 1941, the Belfast Telegraph newspaper carried a statement from Squadron leader Simpson. This came through the Ministry of Information and the Royal Air Force (Northern Ireland) News Service. There was a slight haze at the time, and although the moon was quite bright it was not particularly helpful. As first, when I was over the sea, I saw a couple of blobs, which I later identified as aircraft but it was quite impossible to tell whether they were ours or theirs. I was not left in doubt for long. They had evidently spotted me, and in a very short time showers of bullets were coming in my direction. I immediately veered away, and managed to take up a good attacking position. In doing so I lost sight of one, but kept my eyes on the other. From above I could clearly see that it was a Heinkel. As soon as I got near enough I opened fire but unfortunately I had no luck, so I closed in again, and this time the enemy rear-gunner had a few shots at me, but it wasn’t long before I silenced him. Just at this point the enemy machine did a slow dive. I followed in hot pursuit, and gave him a good long burst from my guns at a range of between 50 and 80 yards. I then saw there was a glow coming from underneath the machine between the wings. Suddenly it blew up as the flames reached the bomb load. The explosion which followed was absolutely shattering. I could not hear it above the roar of my engines, but my machine was caught in the blast, and I was thrown about 300 yards upwards and sideways. I soon righted myself, and when I looked down I saw bits of burning aircraft floating slowly towards the sea. If you enjoyed this post on "Luftwaffe Heinkel shot down over Downpatrick, Co. Down", please share with your friends and followers.